It has been a while, a long while, since I read a book in one sitting. A novel needs a certain collection of attributes to affect readers in that way. 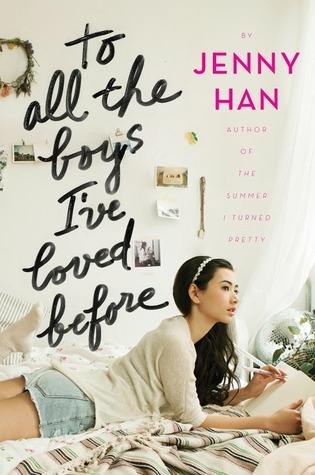 To All the Boys I've Loved Before by Jenny Han definitely has them. [x]Deep connection to the character -- check. [x]Intriguing plot line that is unpredictable -- check. [x]Unique writing style that captivates -- check. Lara Jean is one of the Song sisters. One of three to be specific. She has two sisters, Margot and Kitty. Margot is older and leaving for college while Kitty is younger. Lara Jean is the middle sister, about to embark on her Junior year of high school. Lara Jean is a wonderful alignment of attributes. She's quirky, honest, uncertain, caring, naive, nervous, and even slightly sarcastic. Lara Jean is the girl in high school that goes unnoticed without good reason. Readers will connect with her through her experiences, words, and doubt as she tries to deal with her secrets being revealed. The plot is both lovely and highly entertaining. Right after Margot leaves for college, Lara Jean decides to write her sister's ex-boyfriend one more letter because she thinks she still has feelings for him. She presses between the pages of a book planning to finish it later on. The next day, Peter K walks up to her and asks her about the letter she sent him. The one about the STD's he doesn't have and how he always steals the last piece of pizza like a barbarian. Knowing that something very, very wrong happened, Lara Jean panics. The following events of the story are hilarious, embarassing, and completely understandable. Readers will laugh out loud and shake their heads with wisdom as they see that Lara Jean's solution is slowly spinning out of control.